M/V Super Servant 4 loaded two cruise ships in Montoir de Bretagne. 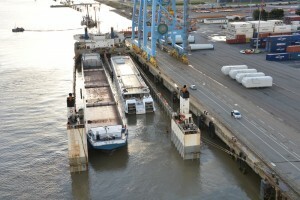 The coordination of port operations and the ship agency have been performed by SOGEBRAS. After the storm that swept the Atlantic coast last week, the semi-submersible vessel carrying two cruise ships named the “Elbe Princesse” and “Danièle”,left the port of Montoir de Bretagne on February 15th. The Super Servant 4 will call in Le Havre and Netherlands before reaching Hamburg, port of arrival of the “Elbe Princesse”. This new generation cruise ship measures 95 meters long, 10.5m wide and has 40 spacious cabins with exterior views for 80 passengers. Greatly anticipated by amateurs of river tourism, she will sail from spring 2016 on the Elbe and the Moldau. The barge Danièle will be delivered to Vlissingen in the Netherlands.